You might recall that a few months ago I was in the market for a new sewing machine, as mine was very basic and did not have a lot of features. I spent SO much time researching, because the type of sewing machine I wanted was not cheap, and I’m not one to throw money around willy-nilly. So many weeks were spent reading reviews, watching Youtube videos, and generally trying to get as much information as possible before taking the plunge and buying my new machine. To begin, I would definitely recommend this sewing machine to any beginner or experienced quilter / sewer. Whilst I’d say this sewing machine is aimed at those who quilt and are a little more experienced, this sewing machine can definitely be used by anyone who is only just learning. I know you can purchase after market ones for all kinds of machines, but I love the fact that the extension table is included when you get this machine out of the box. It makes sewing quilts and cushion covers so much easier – I’ll never go back to not having an extension table on my machine. There is a dial to adjust the pressure foot on this machine which is so helpful to me whilst appliqueing. 6 is the highest, and 1 is the lowest. I have it set on about 3 when I’m appliqueing, which makes it a little easier to make minor curves whilst I’m sewing. This was one thing that was a non-negotiable for me on my new sewing machine. The speed control slider is great on this machine – the slow really is quite slow, and the fast is very very fast. I set mine to about mid usually (unless winding a bobbin and then it’s speed demon all the way!). The foot pedal is very well done, as it picks up on minor changes very easily. 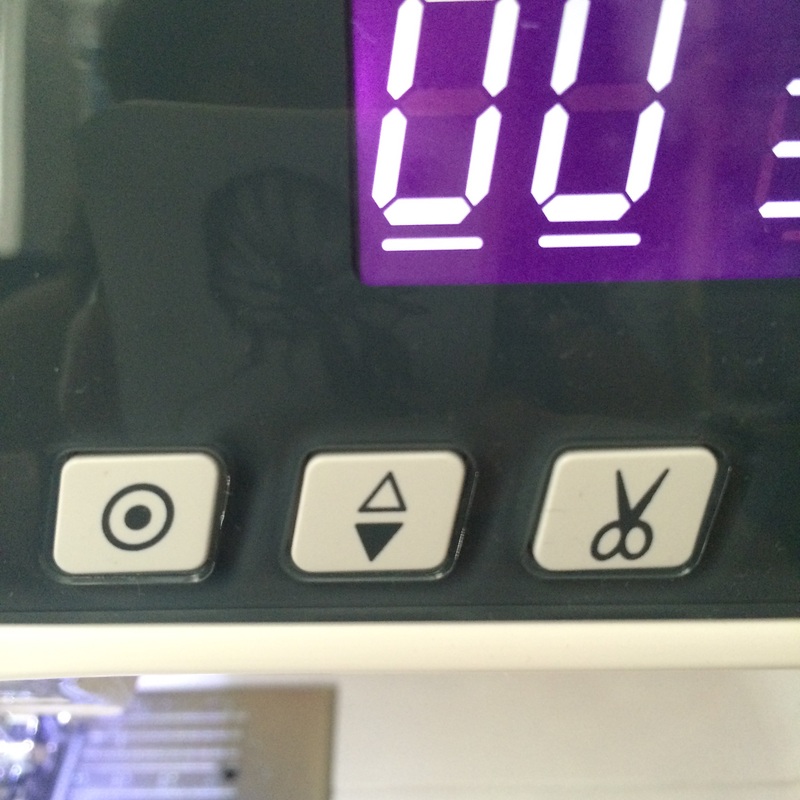 The little scissor icon on the right is the thread cutter button. 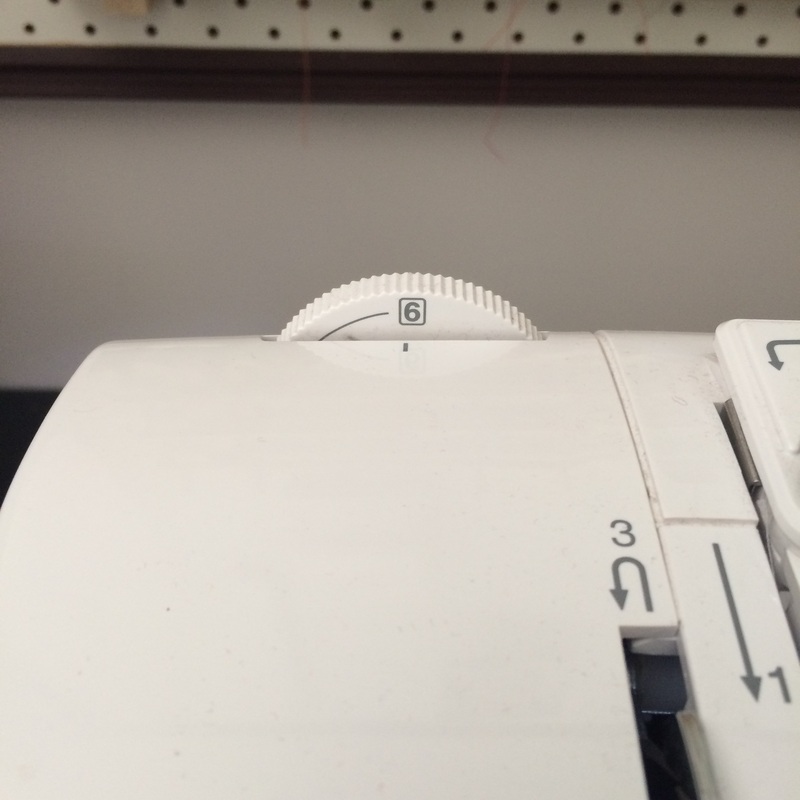 It’s not automatic in that it will cut a thread once you stop sewing, but when you press the button both threads are cut quite close to your piece. I think this is a great little feature, because I don’t have to go through and clip the thread later once I’ve finished piecing. A must for quilters in my mind, and another non-negotiable for me when I was researching sewing machines. A needle up / down function is so handy when turning corners for quilting, or appliqueing. You don’t lost your spot, and your fabric layers are kept together and supported. The function on this machine is remembered, so if you press it to down position, the needle will always finish down. One thing to remember is this function might mean you take an extra stitch – if you take your foot off the pedal and the needle would be up, it will automatically take another stitch. The button on the left of the controls photo is the locking stitch, which is a great feature. It takes 3 small stitches in place of a backstitch to lock the stitches and ensure they don’t unravel – very helpful for any decorative stitches. There are 50 in-built stitches, with various widths and length options available. I particularly love stitch 17 which I use for appliqueing. The decorative stitches are great, and I’ve used stitched 36 for quilting before – it’s a very fun stitch for a baby or childrens quilt. I was really impressed by the feet that came with this sewing machine in the box, particularly the fact it came with a walking foot. A zipper foot, buttonhole, walking foot, overedge foot, 1/4″ foot are all included. For me, the 1/4″ and walking feet being included was awesome. I use these ones so often that it’s nice to know the ones I’m using a genuine Janome parts, that fit my machine. There’s no unnecessary bouncing around whilst I’m stitching which is great. I find the digital display easy to read and use, which is perfect for me. It’s easy to change the stitch type, length and width with just a few button pushes. I’d love if this machine would remember the last stitch picked. When I turn it off, it goes back to the default stitch which you can see in the digital display photo. I’ve been caught out a couple of time when I’ve taken a break, turned off my machine, gone to applique something with a blanket stitch and then realised it’s switch back to a straight stitch by default. This machine has a stop / start button which means you don’t need a presser foot. It takes a couple of slow stitches when starting, then goes to whatever speed you’ve selected with the slider, and then take slow stitches when stop is selected. I imagine this feature would be great for large amounts of quilting, but I find the button is in an awkward location. I’m constantly having to track where it’s located, so I take my eyes off my piece which has resulted in some wonky stitches right at the end. I’m also personally inclined to use the foot pedal, because I can regulate the speed really easily. 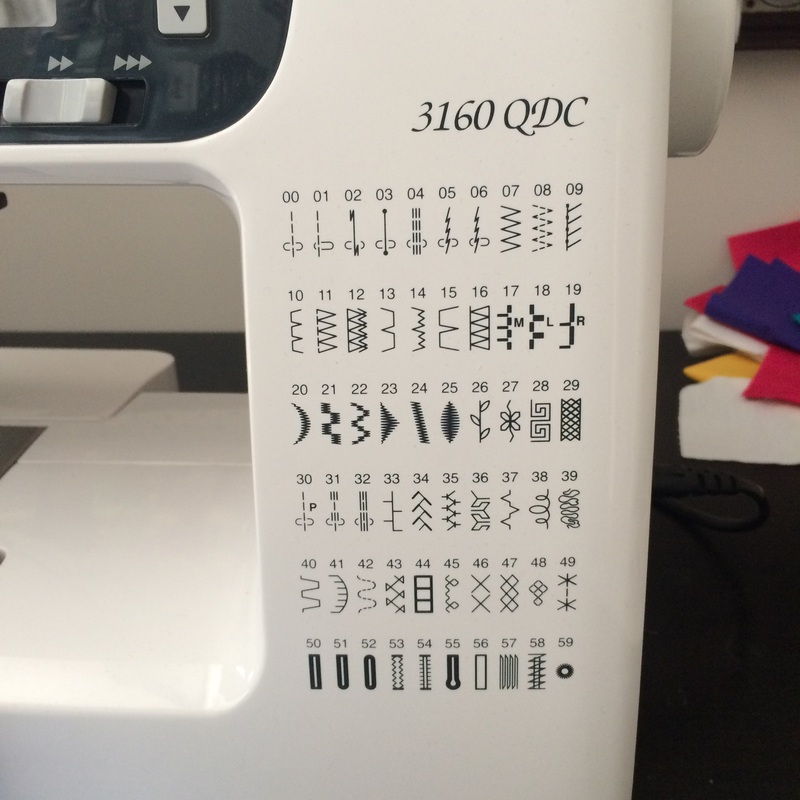 There’s a little overview of the Janome 3160QDC sewing machine – I hope it helps you if you’re considering buying one! When I was researching, I came across some other reviews / guides. I’ve provided links below so you can do some more research before taking the plunge – it’s not a small amount of money by any means, but it’s so worth it I think. I meant to do this little write up a few months ago, but I’m glad I waited. I’ve had 4 months to use it for all sorts of projects, so I know that I 100% love this machine. « Finito – Quilt Fabric Scraps Organised! Holy crap that’s the price of a runabout car! I know! The only reason I was able to afford such a machine was thanks to the combined generosity of family and friends for my birthday. The scary thing is this machine isn’t necessarily at the highest end of the scale! When I was researching I saw machines for >$1,500 plus. I should actually update my post, as I bought it on sale for $750. Thanks for such a thorough review. I’m just starting to look around at better quilting machines, but the price tag means I had better *love* it! The Janome sounds really solid. Oh I agree – so much research to be done before you invest any amount of money into a sewing machine. That’s why I was a little disappointed when I couldn’t find many reviews about the 3160QDC – I hope it helps! Good luck with your search. That’s the sewing machine I use. I recently had to replace the foot pedal under warranty but otherwise, I’ve really enjoyed this machine and have the same pros and cons that you listed. I agree with the headache of the “no memory stitch selection.” I’m always taking pics on my phone before turning off my machine so I remember what stitch setting it was at. Bought one in December 2015 so I could learn to quilt. I lost my husband in July and needed to find interests to distract me from grief… so took quilting classes which required a machine. First thing I did was break the plastic foot attachment . Wasn’t use to the machine . FOOT can be manually lowered and lifted from the inside rt of the needle. Later I found out the Needle Up and Down Button which is wonderful works great. I was able to cheaply replace the foot attachment with a metal one. Also was taught to use a upper walking foot from the ACE machine shop in WF Texas. My machine did not come with this attachment . Smooth stitching my first quilt and has been FUN ! i just bought one!! So excited to set up and sew my little heart out! Hi, I just wondered if you had any trouble with the bobbin? I read a few reviews somewhere saying it gets tangled up with the needle or some sort of other problem (not sure exactly). Thank you! Hi Erin, never had any issue with winding a bobbin. Once you’ve slid the holder over to the right, are you then turning the bobbin until it locks in? Hi Erin! I’m relatively new to sewing and have only used 2 older mechanical machines that were given to me (and used them very little!). My nearest, independent sewing shop is selling this Janome 3160QDC model, used, at a great price. They only sell machines that are made with metal internal frames…and maybe metal hooks as well? So, as I consider this machine, at a light 13 pounds (? ), I wonder how can it be so light with all metal frame/components inside? I’m also considering the Magnolia 7330, roughly the same dimensions, but roughly 19 pounds. And I think there are other machines from Janome that are roughly the same size, but heavier. While I am confident in the store to only sell quality used items, I’m not easily able to get there and look inside the machine yet. So I wanted to ask what thoughts you have about where the weight is reduced in the Janome 3160? And will it be as sturdy as a heavier model that perhaps has more metal parts? I have scoured the Janome site and it is not very thorough with details on the “insides” of sewing machines. Thanks in advance and happy 2017…I think you may be past midnight there already? Hi Elizabeth, I’m sorry for my late response. Perhaps there’s more components in the magnolia making it heavier? Or it’s exterior material is slightly heavier. I haven’t heard of that brand to be honest. I can definitely say my Janome is quality; internally it doesn’t look like anything has been “left out” to make it lighter or anything. I’m sure no matter which one you pick they’ll both be great!